Join the Chester River Chorale! Our mission is to provide opportunity, education, and inspiration for amateur singers to strive for artistic excellence. We entertain diverse audiences and enrich the cultural life of the community. The Chester River Chorale is a vibrant all-volunteer, 90-voice community chorus in its 20th season of performing a wide variety of choral music in the Kent County community. Under the leadership of inspiring choral director and experienced professional singer Douglas D. Cox, the Chorale presents several concerts each holiday season and spring. As a non-auditioned community choir, our members range from those with graduate-level music degrees and professional music experience to singers who do not read music. Members range in age from teenagers to octogenarians and come together through a love of singing, learning new music, and expanding their musical skills. If you love to sing, join us! 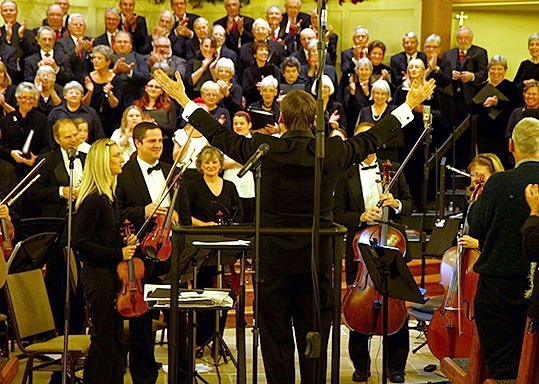 The Chorale's repertoire features classical masterworks and other sacred and contemporary music, including Broadway show tunes, spirituals, folk, pop and contemporary classical. The annual concert schedule includes A Chester River Holiday, a spring concert, and Independence Forever! to kick off the annual Chestertown Tea Party Festival. The Chorale has also performed with the National Music Festival Symphony Orchestra for five seasons. The Chorale is a nonprofit 501(c)(3) organization. Join the Chester River Chorale's chamber ensembles - the Chester Chamber Singers and River Voices - for a joyful celebration of spring, love, and music. Sunday, May 12, 4 p.m. The Chester River Chorale is a 501(c)(3) nonprofit organization funded in part by an operating grant from the Maryland State Arts Council, an agency dedicated to cultivating a vibrant cultural community where the arts thrive. Support is also provided by our Presenting Sponsor, Yerkes Construction, and by the Kent County Arts Council, the Artistic Insights Fund of the Mid-Shore Community Foundation, and our generous patrons, merchant advertisers and audiences. © 2019 Chester River Chorale.